I’m not talking about the one on your piano. I’m talking about the one your agency or church is probably nervous about. C1 – describes a church that uses a language likely to be foreign to the people being reached — so that the inner truths of the religion can be shared in the original language. This is what Roman Catholicism used to do when they would do masses in Latin. C2 – describes a church that is one step friendlier, with religious services in the local language of the people — but everything else is still pretty foreign. C3 – describes a church that is starting to “look like” the local community a bit more. But followers still call themselves “Christians,” even if that term causes locals to bristle. C4 – describes a group that has stopped referring to themselves as a church. Now they’re a contextualized community and each member is known, simply, as a follower if Jesus. C5 – This designation describes, for example, a Muslim who has come to believe in Jesus — but he still calls himself a Muslim. So local Muslims say he’s a strange kind of Muslim and Christians try to think of him as a Muslim who follows Jesus. C6 – This person calls himself a Muslim and hasn’t owned up to the fact that he follows Jesus. For whatever reason, he’s keeping it all a secret. So — which term describes the way YOU would like to start a church and why. Using the comment box below, see if you can convince us that your part of the spectrum is truth… or at least, more effective at bringing people to the truth. Warning: No matter what part of the spectrum you adopt, it won’t be easy to convince everybody. Some people are still going to be up in arms. 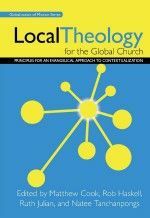 As the church in the global south continues to grow at a rapid pace, the question of how to develop local theologies becomes more and more urgent. This book charts a path forward through exegetical, theological and cultural analysis by scholars who are wrestling with the issues in their own situations around the globe. The contents were developed under the auspices of the World Evangelical Alliance Theological Commission at the Oxford contextualization consultation. WHAT DOES YOUR ORGANIZATION/MISSION USE FOR A PLANNING TOOL? NEED A HELPING HAND? WANT TO ACCOMPLISH MORE? SAVE MONEY ON GROCERIES & USE THE DIFFERENCE FOR MISSIONS? THE BACKPAGE: OUR “30 DAYS” CAMPAIGN WENT WELL; HOW ‘BOUT YOURS? Surprisingly, our team embraced it within about one hour. There are certainly plenty of tools that teams can use. Everything from sending a Microsoft Word doc (or Excel spreadsheet) to one team member at a time … to Google’s new online apps … to GoogleGroups… to other online collaborative software — ad infinitum. But CentralDesktop, though it cost us something (at the level we chose), seemed to offer a great match of tools. The level we chose was the threshold level where we got SSL (secure) web interactivity with one another. That gave us, in one handy package with one handy secure web address, online discussions (with great notification options), document sharing (with version tracking), task lists and milestone building (yes it’s kind of basic, but it’s at least *there*), basic calendaring, lightweight databases, and light reporting… all in one package. Plus we can invite in non- members (i.e., organization volunteers) to our heart’s content — one workspace at a time. On top of all that, the developers seem very accessible through the online forum (they’ve answered every feature request and help request within 2 hours so far), and they’re bringing out a *monthly* upgrade that’s adding real value, every 30 days. So … yes… it’s still early in our use, but it looks extremely promising so far. Check it out for your team. and click on “Add a comment” at the bottom of the item. Thanks! http://www.worldmissions101.blogspot.com I was there about 15 seconds before I found a quote that I put in my permanent quotations database. Thanks to Andy and the group! HELP A NEW MISSIONARY UNDERSTAND CONTEXTUALIZATION — Brigada reader John is compiling resources on contextualization. This will be similar to his previous work on the must read books for all missionaries. This time he wants to compile material on contextualization. He has three questions to which he would love to know your answer. 1. What is the best definition of contextualization? 2. What resources would you recommend to a newly enlisted missionary to help them contextualize their ministry? 3. Where do you point in Scripture that commands the missionary to contextualize in his ministry? and “Add a comment” immediately below the post. Thanks! He felt they had “the best program of sustainable microbusiness enterprise of any Christian organization and perhaps of many non- christian organizations.” He added, “I am not part of their organization but highly recommend their methods and training that they hand off.” Thanks Norm! And ISA, in turn, gave a portion of those funds — $89.05 in face — to help get Brigada onto your screens! Thanks ISA! for sending $75 as a way of saying thanks “all the good information that flows through Brigada.” [blush] (God be praised, Keith!) Please go check out his site today. WE’RE PUBLISHING A HALF MILLION BRIGADA TODAYS THIS YEAR — With over 11,000 subscribers… 52 weeks… that works out to over 500,000 editions in just one year. Our financial needs seem small enough… just $17,150 for all of 2007. Where else can you get that much bang for your buck!? :-) Want to help pump Brigada’s missions mobilization message out to the masses on every continent? You can. Here’s how: Just click on the “Donate” page. You can pull the money from your PayPal account or from any major credit card. Or if you prefer, send a check payable to Team Expansion to: Team Expansion (Brigada secretary), 13711 Willow Reed Dr., Louisville, KY 40299. (Team Expansion is a 501(c)3 incorporation so for USA citizens, your checks made out to Team Expansion are tax-deductible.) As always, be sure to let us know if you’d like us to promote any particular service or ministry, or if you’d prefer your gift be anonymous. And thank you in advance for helping. As mentioned earlier (in “THE BACKPAGE: JOIN 30 DAYS OF PRAYER FOR THE MUSLIM WORLD”, Sept. 14th, 2007 Brigada Today), some 400 people got involved with either the kids version or the adult version. It’s leading in nicely toward our 30 days of emphasis on a country in the Middle East. We’ll pass out *those* booklets this Sunday and next, then begin the emphasis the week following. We’ll enclose an insert with specific prayers about two of our church members that will be journeying to the country to survey it for our congregation and the mission with which we hope to partner (Team Expansion) for this outreach. It’s an exciting time for the church… and there are lots of folks ready to get involved. So … bravo to the “30 Days” bunch for helping us launch the whole thing. The work is worth it! and click on “add a comment” below the item. Thanks! 7. DO YOU FIND ENGLISH DIFFICULT? 9. THANKS FOR THE PARTNERSHIP! 3. GRANTS AND LOAN DIRECTORY — The “American Grants and Loans Directory” is now available. This publication contains more than 1500 financial programs, subsidies, scholarship, grants and loans offered by the US federal government. It also includes over 700 financing programs available by foundations across the United States. The Canadian Subsidy Directory is also available for Canada. The CD version is $69.95 and the printed version is $149.95. To order, just call 450-224-9275 in Canada. 4. MAPPING FOR MISSION WORKSHOP — Catch some introductory training for the Global Ministry Mapping System (GMMS) for ArcView, December 5-9, 2005 at Global Mapping International (Colorado Springs, CO). Learn how to implement the GMMS for your ministry. Tuition will be $300.00 for GMMS licensees & $500.00 for those who have not acquired the GMMS (Price includes printed materials and lunches/snacks). Multiple attendees from a single organization will each receive a $50.00 tuition discount. For more information, contact Tony tony(at)gmi(dot)org or call 1-800-569-6312. Remember to respond quickly. Space is limited to 10 participants. If you sign up by November 21st, you’ll guarantee your spot and save $25.00 off registration. (Note: The cost of lodging and meals other than lunch are not included in the tuition fees.) Visit http://www.gmi.org/gmms to find out more. 6. SHARPENING YOUR INTERPERSONAL SKILLS (SYIS) — This valuable workshop will be held February 27 to March 3, 2006 at Gateway Missionary Training Centre in Langley B.C. The Cost will be $190.00CDN which includes lunch and course materials. This course, developed by Dr. Ken Williams, is offered internationally and has been greatly appreciated by intercultural workers around the world. Gateway Missionary Training Centre has offered the workshop each year since February 2001 to missionaries from a variety of organizations. For more information contact info(at)gatewaytraining(dot)org or call 604-530-4283 and ask for Beverly. 7. DO YOU FIND ENGLISH DIFFICULT? — Then go to http://www.easyenglish.info and click on ‘What’s new’. Now download ‘Stories from the Book of Genesis’. Helen Sealey has written these exciting stories in short sentences, using Accessible EasyEnglish (level A 1200 words in the lexicon). She has designed them especially for anyone who struggles to read English. The EasyEnglish Bible Dictionary is also available now, from the same website. This item explains over 800 Bible words in EasyEnglish. 9. THANKS FOR THE PARTNERSHIP! — Thanks to Dial-Abroad for their sponsorship in response to Brigada readers signing up with their service. This past week, they sent $103.76… so if you ever need phone services, please consider them first. Just go to http://www.dial-abroad.org/brigada.htm and choose the long-distance service, “Dial-Abroad”. 10. THE BACK PAGE: LESSONS FROM A SMALL AIRCRAFT FLIGHT — When I’m not writing Brigada material, I’m trying to do my best to lead a little missions agency called Team Expansion, with about 260 full-time workers in 36 countries. When our field workers experience a loss of a parent or child, we try to make sure someone from our “home office” attends the funeral with them. I’m guessing most other agencies do the same. Well one of those funerals was scheduled to happen today. The funeral was slated to take place in a small rural community in Central Illinois. Commercial flights just didn’t line up . . . so I was forced to plan to make the 9-hour drive (originating at a missions convention I was attending), leaving at 2am or so. Not an ideal situation… but doable. (We do what we have to do, right? :-) ) Well the truth is, my co-workers love me… so after I went to sleep at 9:30pm or so, they were like little elves, scurrying around arranging better options for me. :-) When my alarm went off at 1:30, I found a note under my door explaining that they had managed to secure a friend of the mission to fly me there in a private plane. What’s more, another staff person had volunteered to accompany me. I was instructed to go back to bed and sleep for another 4 hours. Instead of having to drive 9 hours one way, the pilot got me there and back in 5 hours round trip! As I pondered the events of the day, I took away a few lessons from the whole process. First, I’m convinced that scheduling the trip to the funeral was the right thing, even though it was hard. The truth is — sometimes we evaluate our courses of action based on how difficult we guess they’ll be. More and more I’m realizing that if I just focus on doing what’s right, lots of the infrastructure grows up after the decision is made. Finally, I was thrilled at my team’s willingness to take initiative. Can you believe they changed my travel plans “while I was sleeping!” But one of the reasons they took that initiative, I think, was because they knew me well enough to know that I’ve empowered them to do more than just *talk*. They know they can take action and, within reason, make big changes — even changes that impact the president :-) — and life will go on. In fact, lots of times, it goes on better! So … next time you think you have your travel plans set for the morrow, beware closing your eyes to go to sleep — if you’ve trained your team to dream, plan, and take action. You just might wake up to learn that the tables have turned… and the outcome just might be tons better than what you had originally hoped! And that’s a good thing… because it’s truly a jungle out there. WHAT’S THE BEST PATH TO AN INDIGENOUS CHURCH? I would have thought we’d be hearing lots about the big-time gathering that the Billy Graham Center is hosting in Orlando, Sept. 20-23. Supposedly, some 1500 leaders (80% of the leadership of the missionary force in North America) are headed there… including those gathering for the EFMA and the IFMA conventions. But instead, at least from where we’ve been sitting, there has been a pretty strange silence. Speakers include Tom Houston and others. Other groups like ACMC, Willow Creek Int’l, WEF, and Intent are rallying there too. To learn more, click to: http://www.godsmission.com or email gmc wheaton edu (gmc wheaton edu) . Whoa… We got a lot of email expressing opinions on the “former Soviet Union” issue. TAKEN TO TASK OVER THE TERM, “FORMER SOVIET UNION”.) The opinions came in all over the board but the general consensus was . . . it’s not an easy task to describe such a complex world! In the end, it seems the consensus is… we have to use several terms. No one term adequately describes the vast mosaic that used to be the USSR. Several Brigada Today participants wrote from within ___ (whatever you want to call it ) to say that they totally understand and that “former Soviet Union” is an understandable compromise (though probably still a compromise). Others urged switching to several terms — like Central Europe, Eastern Europe, Central Asia, etc. “Russian Speaking Republics” wasn’t at all very popular, for obvious reasons. (Some are trying to lose that language.) So… it’s a naming jungle out there! For those who need to go in print with descriptive terms, we encourage you to be sensitive… and for those reading the terms, we urge you to extend grace! It’s not an easy task. To discuss the handling of addresses, email: tony soon org uk (tony soon org uk) . Free copies of the paper in easy-English, French, Swahili and African Portuguese are also available to any Christian group to use for local distribution. Create International now offers both their popular Video People Profiles (documentaries on specific unreached people groups) and Evangelistic films in VideoCD format as well as the original VHS tape format. VideoCDs can be played on both DVD players and on most computers with a CD player. Also, in an effort to make these resources more accessible they have reduced the price of these presentations by 25% across the board and now you can order all of their resources at their new website at: http://createinternational.com/VideoWebPage.html or http://createinternational.com/ev.html. In addition to their video resources, Create International also produces PhotoCD-ROM disks. Their all-in-one photoCD offers over 300 of their most popular images of unreached peoples along with sample video clips, images of work among UPGs, indigenous music, and more. Their new offer includes customized photoCDs of 50 hiRes images such as: Peoples of China, India, Africa, or Indonesia. Check it out and choose the region or country which interests you, http://createinternational.com/UPGPhotoCD.html. Order online and save 20% off the normal price. “Indigitech”, is a new website developed by Create International for both education and dissemination of contextual evangelistic resources. It is their desire that Indigitech become a bridge between fieldworkers and contextual resources which are now available. It includes many links to video, audio, tract, and webevangelism resources as well as offering free downloadable materials. Please make use of this vital Internet tool at: http://createinternational.com/indigitech/. Notice that if you can’t afford Norton Antivirus 2001 (which is very effective against this and most other viruses), there are instructions at the site above on how to remove the virus manually. There are also instructions on how to recognize it. Want to make your PC less vulnerable to attacks from these kinds of viruses or worms? Unhook the Visual Basic script tool. Most individuals probably don’t need it anyway. Just open My Computer, then open Control Panel, then open Add/Remove Programs. Then click on the “Windows Setup” tab. This gets you to Windows features that you can either add or remove. Highlight “Accessories”, then click on the Details button. Scroll down the list of features, uncheck “Windows Scripting Host” Click OK to save changes, and close out each dialogue window. With Windows Scripting Host uninstalled, those silly “Trojan horse virus programs” won’t be able to run Visual Basic Scripts. They’re rampant… so be careful… It truly is a jungle out there! Have you noticed how your PC slows down as you add zillions of fonts (some of which you never use anyway?). Get this free viewing utility, then weed out the ones you don’t use. “FontViewer 2” scans the files on your hard drive then tells you which fonts you actually use. Pretty handy! It then highlights the files you don’t use, allowing you to remove them . . . at least for the time being. It runs under Win 95, 98, ME, NT 4.0 or 2000. Just head on over to: http://www.pcmag.com/utilities to get your copy… for free! Tell ’em Brigada sent you! Just as the seasons change from winter & spring to summer & fall, so flowed the wide-ranging responses to the recent Backpage editorial, “SILENT SPRING: WHERE HAS ALL THE HOOPLA GONE?” You’ll recall that in my original editorial, I observed that there seemed to be a kind of “lull” going on out there — at least in some circles — when it comes to large-scale missions mobilization. By and large, it seemed that many agreed. What was notable was the rationale behind the silence. (There were a ton of responses. To read a compilation, send a blank email message to: silent-spring brigada org (silent-spring brigada org) and a copy of the 38K compilation will be automatically sent to your email inbox immediately. In her 1962 book, Silent Spring, Rachel Carson effectively raised the national consciousness on all things regarding pesticides, ultimately forcing the government to ban DDT and spurring revolutionary changes in the laws affecting our air, land, and water. In addition, Carson’s book was instrumental in launching the “environmental movement.” According to many observers, it is one of the landmark books of the twentieth century. Unfortunately, the little item in Brigada Today won’t end up making such a big impact. That’s a shame. First of all, it’s a shame because instead of dying birds, we’ve got eternally lost civilizations. Second, it’s a pity because it seemed we had such momentum going (95-99)! And third, it’s a shame because Rachel Carson became such a famous hero. By contrast, whoever heard of Doug Lucas? I’ll admit that I see some anecdotal evidence of this, now and then, but I’ll hasten to add that, in my travels so far, it seems this non-Western-based mission effort is, at best, “uneven,” in that there are still vast uncharted territories where no one is venturing to set up shop. And dare I say that it seems to mostly be happening in partnership with Western projects rather than totally in isolation of them. Do you agree? If this is the case, the implications are far-reaching. For… (and I know it’ll sound colonial and patronizing, so I’ll only mention the possibility) if we back off, then could it be that we’ll lose whatever ground we’ve gained in helping mission-receiving churches to become mission-senders? The other side of this theory comes from the “now-it’s-a-grass-roots-affair” believers. These folks argued that the current situation is actually healthier, because instead of having to follow a vocal, motivational leader (like… maybe… Luis Bush??? ), churches and agencies (Western and non-Western) have caught the vision and they’re functioning in and near unreached peoples with high security — so no wonder I wouldn’t be hearing about it. Okay. Maybe. But in my limited experience, we hear feedback on the field side quite easily, even if we’re not hearing much on the sender-side of things. And on the field side, I must say, I don’t think I’m seeing throngs of new career-oriented cross-cultural witnesses. Lots of short-termers, maybe… in fact hordes of short-termers, in some cases. But, in some areas, I have to wonder who will become the five-year-folks — or better yet — the fifteen year folks — that we so desperately need. These folks mostly sounded rather like realists. They basically “called a spade a spade.” Having heard lots of “noise” in the latter decade, they’re now wondering what’s become of it all. To these folks — and there were several — the huge groundswell of new full-time workers never really materialized. In its place are the short-term visitors who never really fully integrate. So long-term church-planting and leadership training, at least among the least reached, will suffer. “Jeff” wrote, “Three college grads who caught my missions obsession in 1995-2000 are now raising support and going [to work among unreached peoples]. But I notice that I am not mobilizing new folks as quickly. I have noticed an increased concern and sense of fear that missions is intolerant and destroys native cultures (typical mantra).” Rats. And lest we pat ourselves on the back too much about short-terms, another wrote, “We have had a summer intern program since 1989. For only the second summer, we will not have any this summer.” Yikes. Has the “magic moment” passed? Harvest Fields Ministries has begun a campaign to recruit 200 church planters for Japan and 50 for the island nation of Taiwan. Harvest Fields is also looking for an Area Director for each country. Contact mike hfministries com (mike hfministries com) or write: Harvest Fields Ministries, PMB 170, 610-A E. Battlefield, Springfield, MO 65807 USA. Meanwhile, Team Expansion is praying God will raise up workers for Tokyo in particular. If you’re interested, write to info TeamExpansion org (info TeamExpansion org) and/or visit the Team Expansion website at: http://www.teamexpansion.org Prospective recruits can begin with the summer in Tokyo during 2002, at which time they’ll help with church growth research and outreach. Evangelical Ministries to New Religions (EMNR) is accepting paper proposals for the 2002 annual conference Feb. 21-23 in Louisville, KY at Southern Baptist Theological Seminary. The conference theme is “Refining Responses to New and World Religions in the 21st Century.” Proposals should address issues relevant to cults of Christianity, new religious movements and world religions. Papers will be evaluated on the basis of relevance to issues of missiological importance. Papers demonstrating up-to-date research, familiarity with and use of primary sources, the integration of history, theology, the social sciences and strategies from a soundly evangelical missiological perspective will be given primary consideration. Proposals shall include an abstract of not less than 250 words and must be postmarked by September 30. Please send all proposals to John Morehead at Watchman Fellowship, P.O. Box 227, Loomis, CA 95650-0227, or via e-mail at morehead quiknet com (morehead quiknet com) . For more information about EMNR visit http://www.emnr.org. Here’s a resource (Thanks Keith!) which may help Bible translators. It’s The Word: The Dictionary That Reveals The Hebrew Source Of English, by Isaac E. Mozeson, 2000. According to the author, Hebrew may be the source and key for all languages. Those outside of American need to put .us on the web addresses and email, after .com. http://www.hebrewworld.com/theword.html http://www.amazon.com for reviews http://www.swrc.com for past audio broadcast and book; http://www.cftinet.com/~mordecai for author’s web site, and email, mozeson yahoo com (mozeson yahoo com) . The article “Transplanted and Contextualized Churches” is the subject for this Monthly Missiological Reflection by Dr. Gailyn Van Rheenen. This is a timely topic because many missions churches, like banana plants in a cold climate, are unable to reproduce and need special care just to survive. You can read this article at http://www.missiology.org/MMR/mmr17.htm You can subscribe to future Missiological Reflections at http://www.missiology.org/MMR/subscribe.asp.